Literature indicates that Local Government Authorities (LGAs) have problems in meeting citizens’ demands. This may be attributed to the limitations of LGAs Information Technology (IT) infrastructures that are not integrated and do not deliver end-to-end integrated services. Enterprise Application Integration (EAI) has emerged to support organizations to integrate their IT infrastructures and deliver a high quality of services. Despite the fact that many other private and public (healthcare) organizations have adopted EAI, its application in LGAs is limited. For this reason, LGAs need to realise the importance of EAI and speed up their decision-making process to adopt it. Thus, further research is required to support the decision-making process in LGAs for EAI adoption. The applicability and validity of the existing EAI adoption models in LGAs is arguable and under research, as these models were proposed to support the decision-making process in other sectors and not in LGAs. The reason is that there are differences indicating that the factors that influence the decision-making process for EAI adoption differ from one type of organization to the other, depending among others on the nature, and the size (e.g. one set of factors is used to support EAI adoption in SMEs and another in large organizations). Therefore, the authors demonstrate that it is of high importance to investigate this area within LGAs and result in research that contributes towards successful EAI adoption in LGAs. During the last decades, several LGAs have widely focused on the use of Information Systems (IS) to overcome their organisational problems and automate their business processes and functions. LGAs focused on IS to provide direct support to meet citizens’ needs including housing, social services, and the management of a complex service infrastructure that supports communities and businesses (Johnson and King, 2005). However, IS developments within LGAs have resulted in non-integrated IT infrastructure (Beaumaster, 2002). The reason is that each LGA autonomously made its own IT operation decisions based on its needs (Janssen and Cresswell 2005). Additionally, there was rarely a single approach for developing IS, as organisations have developed their applications without a common architectural planning (Markus and Tanis, 1999). Moreover, each LGA display differences in the way: (a) their business processes are implemented, and (b) they make their decisions that differs a lot from other private organisations. These theorised evidences illustrate that LGAs operate and function independently and do not share information and functionality with other LGAs (Gortmaker and Janssen 2004; Ralph and Wyatt, 1998). Such aforesaid concerns have resulted in several problems and influencing the decision making process in LGAs. For example, Benynon-Davies and Williams (2003) report that within LGAs there is not enough emphasis on the reengineering of legacy business processes and applications. The reason is that legacy business processes and applications have been developed over several years to serve their core processing needs and government officials are reluctant to change their operational procedures (Lam, 2005). Furthermore, McIvor et al., (2002) report that the inherent design of many legacy applications was as standalone, typically mainframe-based applications, rather than as network-integrated applications. 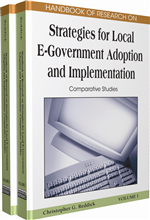 The reluctance in government officials to bring change in their operational practices and availability of non-integrated legacy applications has resulted in poor citizen service provisioning and making decision-making process more complex (Lam, 2005; McIvor et al., 2002). Thus, the integration of legacy business processes and applications is required to support coordination in LGAs, enhance the decision-making process and provide better services to citizens (Janssen and Cresswell, 2005; McIvor et al., 2002). A major concern for LGA management while adopting IT is the investment decision that is associated with the change in organisation and its IT infrastructure (Signore et al., 2005). The reason is that LGAs lack sufficient amount of money for their IT infrastructure (Ward and Mitchell, 2004). Wagnar and Antonucci (2004) support that LGA’s budgets are often reduced and sometimes allocated with appropriations. Lam (2005) also reports that government organisations face difficulties in obtaining the level of funding requested, especially if funding is drawn from a funding pool that is meant to serve multiple initiatives. Therefore, LGAs are seeking for integration solutions that are cost effective and as a result provide better services to their citizens. Electronic Government (e-Government): E-Government (from electronic government, also known as e-gov, digital government, online government or in a certain context transformational government) refers to the use of internet technology as a platform for exchanging information, providing services and transacting with citizens, businesses, and other arms of government. E-Government may be applied by the legislature, judiciary, or administration, in order to improve internal efficiency, the delivery of public services, or processes of democratic governance. Enterprise Application Integration (EAI): Unrestricted sharing of information between two or more enterprise applications. A set of technologies that allow the movement and exchange of information between different applications and business processes within and between organisations. Local Government Authorities (LGAs): LGAs are administrative offices that are smaller than a central government and are in direct contact with the community. The term is used to contrast with offices at nation-state level, which are referred to as the central government or national government. The pattern of LGAs is complex, with the distribution of functions varying according to the local arrangements. Information Technology Infrastructure: The term IT infrastructure refers to the part of the infrastructure of an organisation that forms a platform for the IT applications.